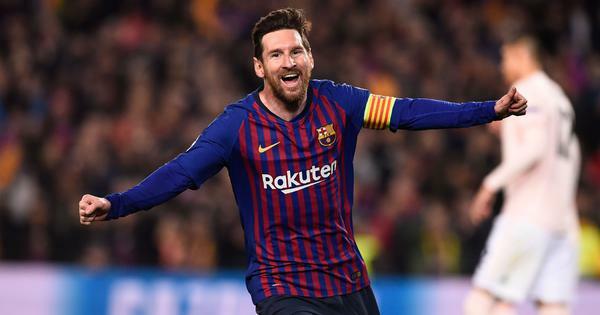 Lionel Messi was at his sublime best as he pounced on two Manchester United mistakes to score a brace as Barcelona breezed into the Champions League semi-finals on Tuesday. The Argentina superstar opened the scoring in the 16th minute and then added another goal in the 20th as the United defence was left reeling in face of his swift attack. The fact that it came after a the Red Devils made a strong start at Camp Nou after conceding just the own goal in the first leg at Old Trafford made it an even more vintage Messi performance. But United errors notwithstanding, it was another night of genius for Messi. He destroyed the defence, Young in particular, and goalkeeper de Gea had no answer either. Leo Messi scores again… but it’s one of the worst goalkeeper howlers you’ll ever see from David de Gea. I’m Chris Smalling. And I’m Phil Jones.